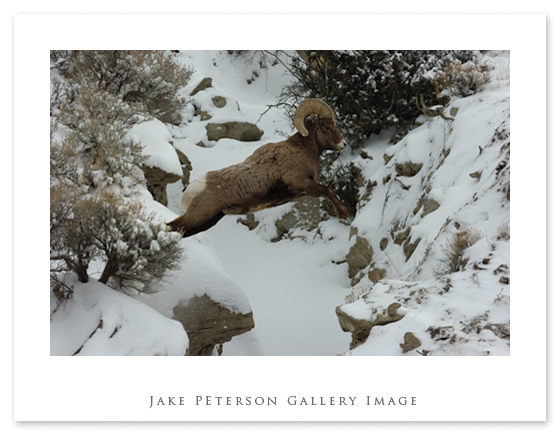 Jake Peterson's Blog » More Sheep! 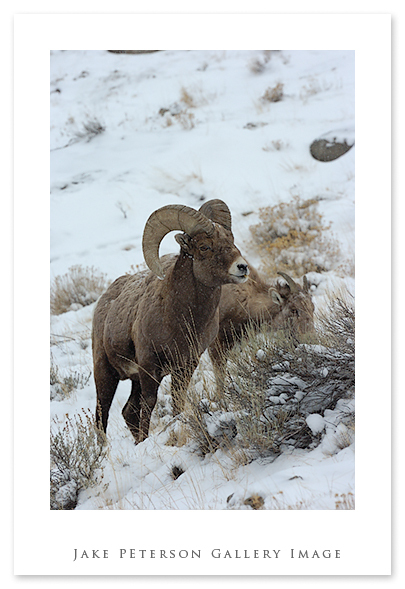 That’s right it’s more Bighorn Sheep! Jeff Cable, my folks and I have been out in Yellowstone for the last couple of days photographing anything that would stay in front of the lens. Friday with Brutus was a blast but unfortunately it had to end. Saturday was a fun ride around in the park in which we saw 15 wolves and heard of another 8 roaming around. None of them were anywhere close to being within range to photograph, somehow half a mile is still too far away, go figure. Yesterday we ventured into the park again after the roads were reopened, which were closed due to wind and snow. Upon entering we found these guys. These are the sheep that inhabit the north entrance. Surprisingly they were quite low which is odd considering this time of the year. The snowfall just isn’t enough to force them away. We spent a good hour watching a large group, including five or six rams. One of the shots I’ve always wanted but never could get was a shot of one jumping and freezing it in mid air. This was my first attempt and although the compostion is good the sharpness is not. I thought i would post it anyway cuz i still like it. The three amigos had to leave today so it’s just me again up here in the rockies, sharing some of the delights with anyone that stops by.